The letters in all Cardiganshire vehicle registrations between 1903 and 2001 are 'EJ'. If you are looking for details of vehicles from elsewhere click here for a list of British motor vehicle districts. 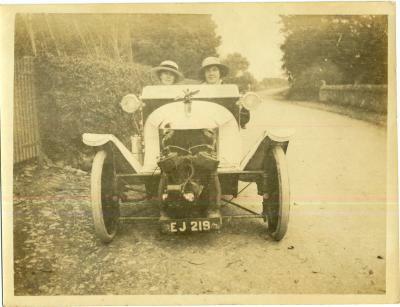 Cardiganshire's early vehicle registrations are now also exclusively available on our website as a searchable database. Ceredigion Archives holds registers of vehicle registration for the county's 'EJ' licence plates for the years 1903  1974 (see the Catalogue section of this website). The registration books give, alongside the registration number, the name of the person registering the vehicle, his/her address, the date of registration, the make or model (and colour) of car, sometimes its serial number and its horse-power. The format of the registers changed a little over the years but the information does not change very much. There are a few gaps in the record (no surviving register between January 1948 and May 1949 for instance) but details of most registrations survive. We can supply an A3 colour photocopy of an entry from the register for £2.00 incl. postage and packing (£1.20 for the copy only), or for £7.00 we can supply the copy with a signed letter confirming the authenticity of the copy.